Watch the video to learn three different processes we use to make stunning custom award medallions. Find out more about finishing techniques and time required to ship your order! 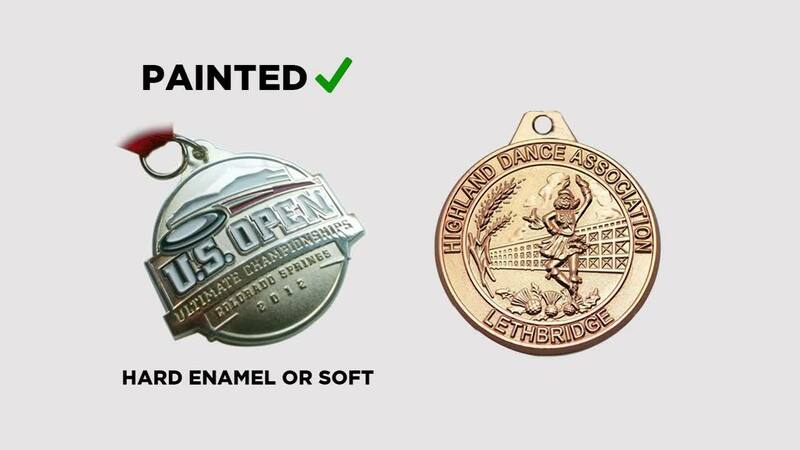 We supply hockey tournament medals, ringette, boxing, gymastics, highland games and even academic medals. When quality counts. A great choice for logo pins and trading pins. What's the difference between hard and soft? The best choice for most customers. Suitable for logo pins, award pins and education. Perfect for award pins, academic pins, volunteer recognition and historical pins. Our "Made in Canada" product. Any photo or design style. design covered with clear epoxy dome. We've been a leading supplier of custom sport medals since 1971. Our family business started as a factory and then shifted to importing in the 2000's. It's easy to get your project started. We offer die struck, cast or stock medals. Average lead time is 3 weeks. Pricing depends on size, thickness and ribbon choice. We don't have a set minimum order quantity. But set-up charges for this product usually above $200 plus the unit cost. After 47 years in the business, you can be assured we've done our fair share of custom sport medals for hockey and ringette. Some of our clients include The Rocky Mountain Summit, Lower Mainland Ringette, Zone 4 Ringette Alberta and Yukon Indian Hockey Association to name a few. Ultimate Promotions is no stranger to International sporting events. We've been supplying the World Flying Disc Federation for over 15 years. We were recently awarded the contract for the World Paranordic Games in Prince George.